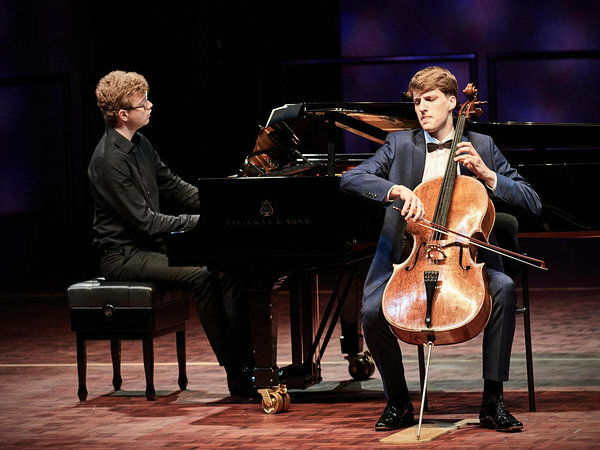 Marcel Johannes Kits (1995) is one of the most promising young cellists to emerge from Estonia, who has won 1st prizes at the major competitions in Estonia (TV competition “Classical Stars” in 2013 and National String Competition in 2015). In 2016 he won the 1st prize and 2 special prizes at the Johannes Brahms competition in Pörtschach (Austria). During this season, he has performed as soloist with Estonian National SO (conductors Mikk Murdvee and Olari Elts), Südwestdeutsches Kammerorchester Pforzheim (conductor Wolfgang Emanuel Schmidt), Israel SO Rishon LeZion (conductor Andres Mustonen) and Euro Symphony SFK. In March he had a concert tour in Estonia with pianist Sten Heinoja and in May he performed in the Pierre Boulez concert hall in Berlin. He has performed as a soloist also with Württembergische Philharmonie Reutlingen, Jena Philharmonic Orchestra, Tallinn Chamber Orchestra, Latvian National SO, St. Petersburg SO, Pärnu City Orchestra, Liepāja SO, Orchestra Ensemble Kanazawa (Japan), Euro Symphony SFK Orchestra, SO of the Karlsruhe University of Music etc., and worked with conductors such as Risto Joost, Arvo Volmer, Mihkel Kütson and Jüri Alperten. Marcel performed at the gala concert of Estonia’s 97th Independence Day with Estonian National Symphony Orchestra under the baton of Risto Joost. In the next season he will have recital tours in China and Japan and concerts with the Jerusalem Symphony Orchestra (conductor Andres Mustonen) in Israel, Pärnu City Orchestra (conductor Jüri Alperten) in Estonia and with Kymi Sinfonietta (conductor Andres Mustonen) in Finland. In February he will make his debut in Konzerthaus Berlin with pianist Rasmus Andreas Raide and in March they will have a recital tour in Estonia. He is a prize winner of several international competitions: 2nd prize at the international cello competition in Liezen (Austria, 2004), 1st and 2nd prize at the international Karl Davydov cello competition in Kuldiga (Latvia, 2006 and 2012), 2nd prize at the international Dombrovsky competition in Riga (Latvia, 2011). In 2015 he was awarded the prize of the friends and sponsors of Trossingen University of Music. In 2015 he recorded the CD of the Songs of Childhood by Arvo Pärt and in 2016 and 2017 he recorded the CD-s of Deutsche Stiftung Musikleben in Hamburg Laeiszhalle and in the Pierre Boulez concert hall in Berlin. Being passionate about chamber music, he has played from the age of 9 in a piano trio with Robert Traksmann (violin) and Rasmus Andreas Raide (piano). He is also playing chamber music regularly with violinists such as Winfried Rademacher, Christian Ostertag, Christel Lee, Marina Chiche and his twin sister Katariina Maria Kits. Marcel showed great interest in the cello when he was just four years old, and began his first lessons at the age of five with Lembi Mets and Reet Mets. He studied with Laine Leichter in Tallinn Music High School from 2002 and with Mart Laas from 2011 in the same school. From October 2014, he is studying with prof. Francis Gouton in Trossingen University of Music (Germany). He has participated in masterclasses of prof. Maria Kliegel, prof. László Fenyö, prof. Wen-Sinn Yang, prof. Jan-Erik Gustafsson, prof. Marko Ylönen, prof. Jens Peter Maintz, prof. David Geringas and many others. In 2017 he participated in the masterclass of Steven Isserlis at IMS Prussia Cove. In 2010-2014 he was given a full scholarship in the three-week Astona International Summer Academy in Switzerland. Marcel plays an Italian cello made by Francesco Ruggeri (Cremona, 1674) and a bow made by Victor Fetique, both kindly on loan to him by the Deutsche Stiftung Musikleben.